This 1935 Omas Pagliero is a Plevonia button filler in Khaki Green Laminated (Parker Vacumatic look-a-like), set off with Black ends. Pagliero was founded 1917 in Settimo Torinese, Italy and made buttons and other celluloid items. 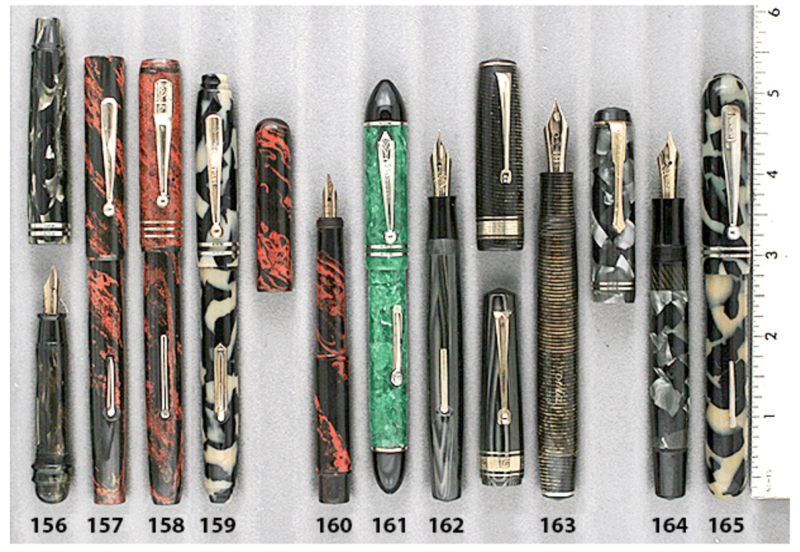 Their fountain pen production started in the mid-1920s. By the 30s they produced only pens. This Plevonia was almost certainly made by Omas for Pagliero, as it is a design match in every way to other Omas pens of the period, and even has an “Omas Extra” nib (medium/fine, extra-flexible). Also, the Pagliero factory produced only mid-range pens and this is clearly a high end pen. Features gold filled trim, including the wide center “Greek Key” cap band and rollerball clip. This is the only size in which the Plevonia was manufactured. Near mint. Item #163 in Catalog #84. This entry was posted in Vintage Pen, Vintage Pens and tagged Catalog, Catalogs, Extraordinary Pens, Fountain Pens, Go Pens, GoPens, Omas, Vintage Fountain Pen, Vintage Fountain Pens, Vintage Pen, Vintage Pens. Bookmark the permalink. Follow any comments here with the RSS feed for this post. Post a comment or leave a trackback: Trackback URL.